File folder games are right up there with busy bags for me. I love these types of educational activities that are more about fun than learning. My kids adore them and use them often in places like waiting rooms, restaurants, and even airplanes. 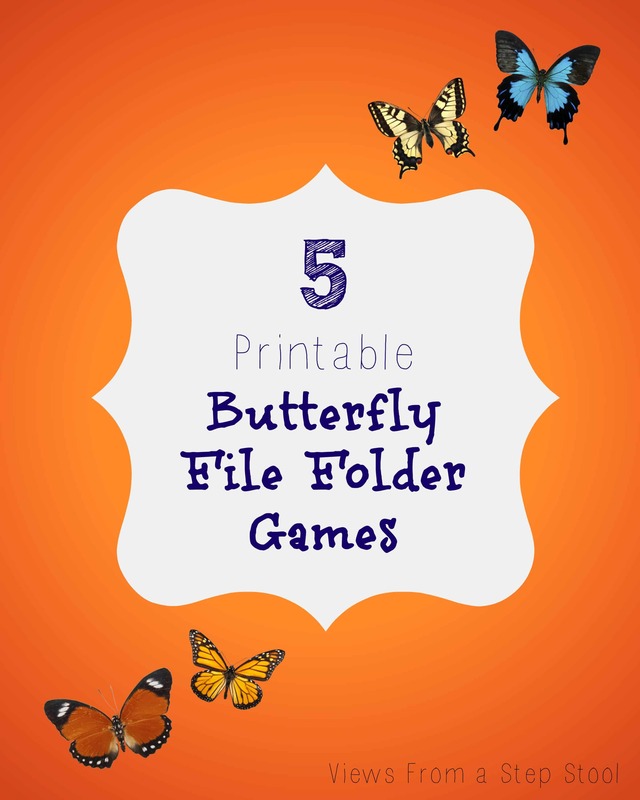 They butterfly file folder games are super easy to assemble, just print and cut! With Spring here, we are all about rainbows, bugs, dirt and the butterfly life cycle! 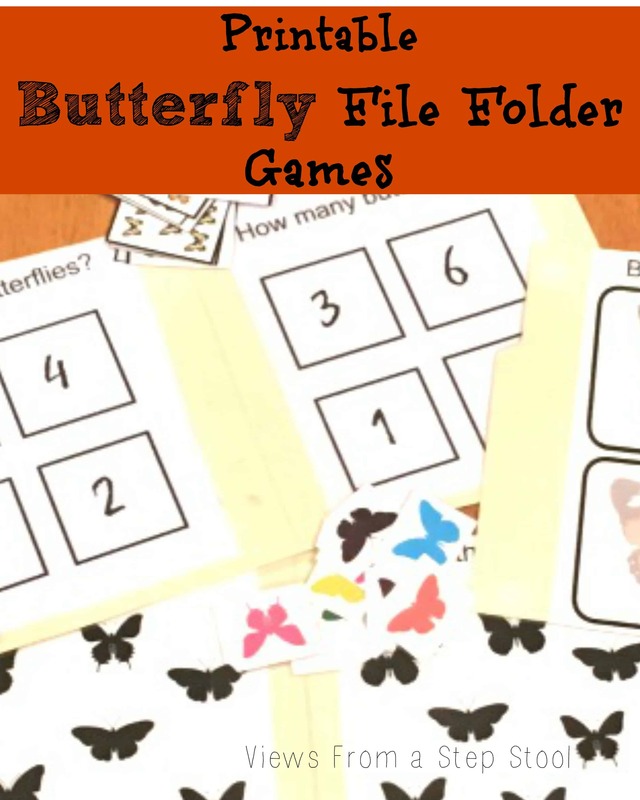 These butterfly file folder games will be the perfect addition to you rotation of toys and games. Go print out the games and I’ll tell you how to assemble them! Tell me where to send the information to get you started by clicking here. If you are a subscriber, head over to the ‘Exclusive Content for Subscribers‘ page to grab yours now! Cut your game ‘boards’ and game pieces out. Glue the boards to the inside of a file folder. Laminate if desired. Place the game pieces in a ziplock bag to keep together. Match the shadow butterfly file folder. Also included are a sorting by size game, and a biggest to smallest sorting game. I hope your kids enjoy these as much as mine do! Check out some of the other fun spring activities we are working on over here! We have some indoor garden starters, a garden sensory bin, and a butterfly life cycle sensory bin! I am all about learning through play, after all, isn’t that what being a kid is all about?! Follow us on Facebook to stay up to date with all we are doing. 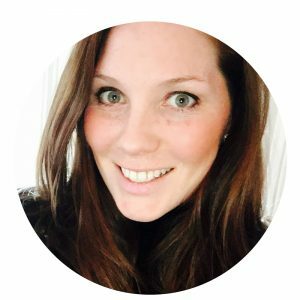 And check out my ‘Outdoor F’un’ Pinterest board to find more ways to play outside in the upcoming months! These look like so much fun. And file folders? Genius! Thanks for the free printable and great idea! These are so fun!! I have never seen a file folder game before… So many possibilities!! This is such a great idea! I’ve never thought to put it in a file folder before! Such easy yet educational activities! Love!